"Chicken pieces are coated with a richly seasoned herb and spice rub, baked with pineapple slices, and served over pineapple jasmine rice." Drain pineapple; reserve 1 tablespoon juice. 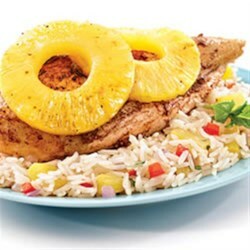 Chop 2 pineapple slices; set aside for rice. Mix together reserved juice, garlic powder, thyme, nutmeg, allspice, salt and cinnamon in small bowl, until blended. Arrange chicken on foil-lined sheet pan. Season with salt and pepper. Rub each breast half with spice mixture over and under the skin. Place two pineapple slices on each breast. Bake at 350 degrees F 30 to 40 minutes, or until internal temperature of chicken reaches 165 degrees F and is no longer pink in center (Note: if using chicken legs, time will need to be increased 15 to 25 minutes). Cook olive oil, red onion and red pepper over medium-high heat in medium saucepan about 5 minutes or until onions are tender. Add rice and chopped pineapple to sauce pan, cook 3 minutes more. Add chicken broth, heat to boiling. Reduce heat to simmer and cook for 15 minutes or until all liquid is absorbed. Add chopped basil; let stand 5 minutes before serving. Arrange rice and chicken on 4 plates for service. Garnish with additional chopped basil, if desired. *Substitution: Instead of 2 whole chicken breasts, you can substitute 4 whole chicken legs. This turned out so good!! Didn't have red peppers but it still tasted really good :-) Will be making this again! Very good, really adds to the flavor of the chicken, I have had many request from my family to do this one again and again. Loved it. Was not big on this recipe. The rice didn't have much flavor and the chicken had too much spice. The pineapple is what saved it.